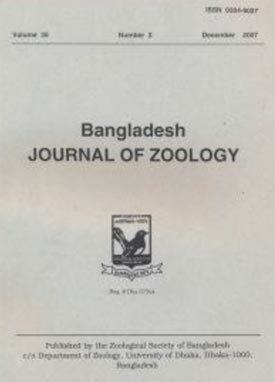 Bangladesh Journal of Zoology is published by Bangladesh Zoological Society, Department of Zoology, University of Dhaka, Dhaka-1000, Bangladesh. The ISSN of the journal is 0304-9027. Manuscripts must be typed double spaced, on one side of good quality 8.5″ x 11″paper with wide margins. Papers should not exceed 8 typed pages. The cover letter of a manuscript must be signed by all co-authors. The first page of the manuscript should contain only the title and name and address of the author(s): the second page, the title and abstract. The Abstract should be followed by key words consisting of not more than 8 words. Title: Titles should be concise, followed by a brief abstract (not exceeding eight printed lines) indicating the objective and precise result or conclusion of the study. A full paper should have the following subtitles: (a) Introduction; (b) Materials and Methods; (c) Results and Discussion; (d) Acknowledgements, if any; and (e) Literature Cited. In case of “Scientific Note“, which should not exceed two printed pages, there is no need for separate subtitles: but references may be listed as usual. Toxonomic papers should be written in a concise telegraphic style. Tables: Tables must be typed on separate sheets of paper. Columns in tables must be suitably title and units of measurements given. Large and cumbersome tables should be avoided. The same data must not be given in both tables and graphs. Illustrations: Drawings and graphs should be made in India ink or printed in a laser printer. The scale of the figures, where required, must be indicated by a scale line on the drawing itself. The plates will be reduced for publication to a size not exceeding 4.5 x 6.5 inches. Legends for figures should be typed on a separate page. Photographic plates should be numbered sequentially and separately from text figure. Only glossy prints, either black and white, or coloured are acceptable. Literature Cited: References in the text should be listed in a section entitled LITERATURE CITED at the end of the paper. Authors of papers and books shall be listed alphabetically. Two papers published by the same author in one year must be cited as, e.g. Hinton (1967 a,b). In citing references the author’s name should be followed by the year of publication, title of the paper, name of the journal with volume and pages included (see example below). Title of papers in languages other than English should be given in English translation, with the original language indicated within brackets. Titles of journals must be abbreviated according to the latest edition of the World List of Scientific Periodicals. When reference is made to a book as a whole the total number of pages should be mentioned but in case of a few papers, only the concerned pages may be mentioned (see below). AMEEN, M and RAHMAN, M.F. 1973. Larval and adult digestive tracts of Tribolium castaneum (Herbst) (Coleoptera: Tenebrionidae). Int. J. Insect Morphol. & Embryol. 2: 137-152. De BEER, G.R. 1940. Embryology and Taxonomy. In: The New Systematics. (Ed., Huxley, J.) Oxford Univ. Press, London, pp.365-393. ALI, S. and RIPLEY, S.D. 1973. Handbook of the Birds of India and Pakistan. Oxford Univ. Press, Bombay, London, New York. Vol.8, xvi +227 pp. CHOWDHURY, S.H. 1970. Functional changes in the midgut epithelium of the larva of Chaoborus obscruipes Van der Wulp (in Russian with English summary) Zool. Zh. 49: 249-256. Reprints: Authors will receive 15 reprints free. Additional copies may be obtained at cost price, order for which must be placed in advance when the manuscript is submitted.